The Original Ball Castors allow for easy handling of all sheet materials including glass, wood, steel, granite, plastic, etc. 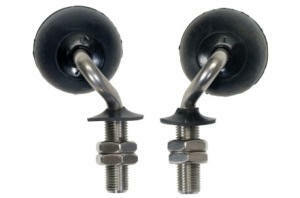 Ball castors are superior to ‘standard’ wheel castors due to the patented design of the unit. The rotation / swiveling of the stem and the independent rotation of the ball provide a multidirectional skid-free surface. These large soft rubber balls are perfect for handling materials with delicate or polished surfaces, such as glass and various sheet metals. 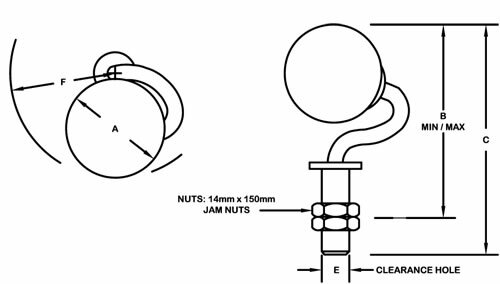 The inverted wheel bearing and cover over the socket bearing makes these ball transfers ideal for dust-laden atmospheres Stem and lock nuts are 400 series stainless steel. Threaded stem: 1-21/32" long. with a thread size of 17/32". Ball Castors can be purchased individually, or we can manufacture complete tables to your requirements. A large stock is maintained to provide a fast turn-around on your order. *THESE CASTERS / CASTORS COME WITH RIGHT AND LEFT HANDED STEMS (MEANING THEY ARE BENT TO THE LEFT OR THE RIGHT). IF YOU ORDER A TOTAL OF 200 PCS, WE WOULD AUTOMATICALLY SHIP HALF THAT QUANTITY AS RIGHT HANDED STEMS, AND HALF THAT QUANTITY AS LEFT HANDED STEMS. The ball castors do not damage the glass, are strong and very practical. Hot casted polyurethane 90° Shore A extends the service life in demanding applications, Excellent tear resistance, Non-Marking, High wear resistance, Higher Heat! In-stock normally 1 - 2 days to ship from our warehouse. **Ready to place an order?